to remind them of their true nature." Imagine for a moment that you can see the energy field around horses. You might see rings of translucence. Each extending out 30 - 100 feet much like a large bubble. You can't see it with open eyes, unless you are an energy reader, but you can begin to feel it with your hands, your skin, your intuitive senses and your heart. The horses can feel you enter it. Your presence pushes on that membrane and they will turn and look at you. Horses living in wild herds can sense you from miles away. Their sensory fields of awareness are so large. Once inside this invisible field you have access to a communication link with that horse. You open the connection to all kinds of information about that horse's past, present and even future. This is where animal communicators derive their information. All that the horses feel and think resides in this energy field. This "invisible" field connects up to a vast web of energy allowing for telepathic communication. It is much like our own Internet Web concept. 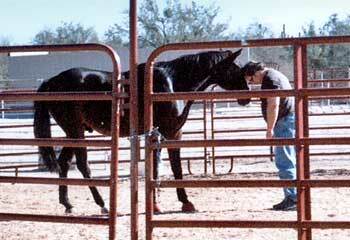 This is how horses living in herds and over great distances to other farms and barns telecommunicate with each other. This is witnessing what Linda Kohanov, author of The Tao of Equus calls "the wide-view of the horse." When you enter into their field your thoughts, feelings and behavior become available as information to them as well, which allows horses to be unencumbered "heart readers" of you. It is like a giant x-ray machine. We present them our own information rich, energy fields. In entering their field, we become stripped of all that we use to cover-up who we are and what we are truly feeling. We are fully exposed to horses. This "knowing" horses have of us, often times before we, ourselves are even aware of, lets them know if we are going to be caring, be safe, can lead them, or if we pose a threat. In our culture, we are taught not to reveal what we truly think or feel for survival. Horses are the opposite. Their survival depends on knowing the whereabouts, feeling states, and mental conditions of each member of the herd. Here is where horses have so much to give us, to help us return to the more natural world of feeling with our intuitive and sensory intelligence, telling the truth, knowing and being connected, and remembering who we really are. Within their "wide-view" energy field, we can even return to our connection to our soul. What takes you away from your feeling heart? How connected do you feel to your soul's voice, vision and dreams? In what ways does your soul speak to you? What dreams or passions have long been denied?